Introducing Intelligent RF Delivery – Meet our New Genius! Our new Genius is the latest and best in Aesthetics today! This technology has evolved over several years, and represents the cutting edge in anti-aging treatment. What is the Genius machine? 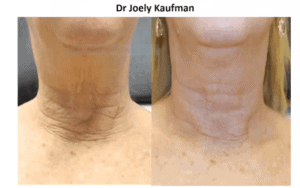 It is a way to tighten skin on the face and neck like we have never witnessed before! 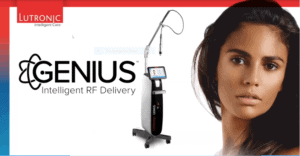 Genius delivers anti-aging results, with minimal discomfort and short recovery time (1-2 days of redness). This technology is a game changer, as it delivers resurfacing results yet is safe enough to be used on the face and neck. No other company offers a RF needling device with the sophistication that Genius offers – no one else even comes close. Our April Special is a Pre-Sale. We are featuring a visit that includes treating your face and neck the same day. The Regular Price for one visit is $1,500. Here’s the Deal – Buy that visit for only $800! You will receive two treatments in one, and two zones treated the same day. What do we mean by two treatments in one? Genius combines the proven benefits of micro-needling with radio-frequency – two treatments in one. We count the face as a zone and the neck as a separate zone and with this incredible deal you will have both zones treated the same day. And you will be amazed how fast and comfortable the treatments are! Combine that with two days of redness, and we have an amazing treatment! Proven to stimulate collagen and elastin for tighter skin, improve the appearance of scars, tighten pores and improve uneven pigmentation (brown discolorations). When you buy Three April Special Deals, Omaha Med Spa will provide a Fourth Visit for FREE! 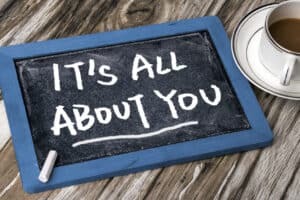 You will see results from one treatment! The benefits continue to build for the next several months as your body builds new collagen and elastin in response to the treatment. By doing 3 visits in a row, you will maximize your results. Space these visit at least one month apart, or up to three months apart. Once you complete 3 visits, Omaha Med Spa will provide a 4th Maintenance Visit at No Additional Charge! That visit will be done one year after your first visit. The Value of this Package is impressive. The Regular Price for One visit to receive Genius treatment of the face and neck is $1,500. Rest assured, even the Regular Price is a great deal for what you are receiving! The Value of 4 visits is $1,500 x 4 = $6,000. With this Offer you will receive 4 visits for Only $2,400! Call us or stop in and we can get you set up. Try out Interest Free Finance Plan – for this deal Dr. Abbott has given us the green light to offer the package deal in 3 Equal Payments! $800 Now (and book your first visit), $800 in 30 days and $800 in 60 days (there is small handling fee of $10 added to each of the 30 day and 60 day treatments. Have You Received a total of 3 SkinPen or 3 Pelleve at Omaha Med Spa in the past? If so, you will receive an additional saving on this deal. Call us for more details (402) 614-5556. 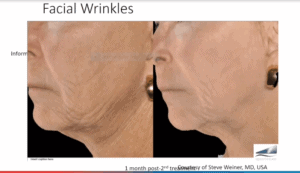 I the picture above Dr. Steve Weiner shows the results after only two treatments. Wrinkles are less and skin laxity is improved. Please note that Infini was the precursor to Genius. You can think of Genius as a “new improved version of Infini” and it really is. Everyone’s results will be different, but what we know for sure is that everyone who is treated will be producing new collagen and elastin – and this is what leads to skin tightening. Limit sun exposure, cigarette smoke and pollutants to maintain optimal long term results. 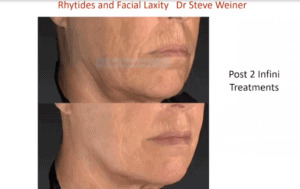 I am excited by what this picture from Dr. Weiner shows – in a mature face, with severe skin laxity there is now hope that a treatment can deliver results that everyone will see, without changing your appearance. Posted on Jan 27, 2108 “My experience at Omaha Med Spa was amazing! Dr. Abbot knew and understood what I wanted. He did not try to pitch a sale for other services like most places would. I will be going back and would highly recommend to others!” N.N. Try our Supplement Injections to improve your health and wellness!